Through the Tenants’ Rights Hotline, Squared Away app, and organizing + advocacy efforts MTO works with over 15,000 Chicago area renters a year. Majority of the agency’s Hotline callers are women of color who are mothers and the head-of-household. They call seeking assistance to address unhealthy apartment conditions, safety issues, and to stabilize their families’ housing (and avoid landlord-tenant conflicts that may lead to an unwarranted eviction). They are learning their rights as renters and how to exercise those rights for change. They are the “[s]heroes” of their families and our communities, and inspire us all to stand against injustice. MTO’s Annual Fundraiser is around the corner and this year’s theme is in recognition of women of color who take action to fight for housing justice and human rights, like Shirley Chisholm– an advocate for civil and human rights, as well as, the first Black woman elected to the U.S. House of Representatives 50 years ago and a founding member of the Congressional Black Caucus. Like Chisholm, MTO and our supporters are committed to building shared, collective power and responsibility through the education and empowerment of renters in need. People most impacted by decisions and policies must have seats at the decision making tables because the inclusion of their voice, expertise, and creativity is what democracy looks like. Democracy is an inclusive action that requires the time, energy, and investment of us all to create positive social change. Thank you for supporting housing justice, equity, and human rights with MTO! Get your tickets here! 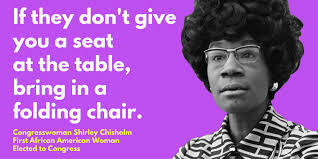 Join us in celebrating the impact women of color who have not only brought their voice, brilliance, and folding chair to the decision making table, but who empower women, youth, communities of color, and everyday people to use their voice, share their brilliance, and place their chairs aside sisters at the table. Honorees include: Pamela Silas (Alfonso); Dr. Beth E. Richie; Deborah Bennett; and Tolanda McMullen. Landlords in Chicago must heat residential buildings to at least 68 degrees during the day and 66 degrees overnight (from September 15 to June 1). 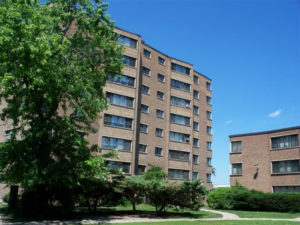 If you are unable to resolve a heating problem with your landlord, call our Hotline between 1-5PM, M-F at 773-292-4988. You can also send your landlord a 24-hour notice using Squared Away Chicago. It is vital to know your rights and to look out for the homeless, elderly, and your most vulnerable neighbors during extremely cold weather. If you are worried that your pipes might freeze, leave the tap dripping overnight to ensure they do not freeze. Also, put a towel under your door to help keep the heat inside. If you must, use a space heater to keep warm but DO NOT use your gas stove to heat your apartment! 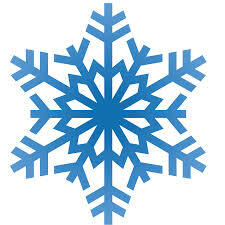 When it snows, make sure to clear off sidewalks for the elderly, disabled and young children in strollers. For snow removal assistance, call 311 or click HERE. Keep extra hats, gloves and scarves with you when you’re on the move. Your extra gloves might save someone’s fingers from frostbite. IMPORTANT NOTE: Anytime you call 311, get a reference # so you have a record of your call! The Chicago Park District has designated 62 Field houses as warming centers for the remainder of the Winter. Click here for locations. This Giving Tuesday, Give to the expecting mother, and her 3 young children, whose only wish is to secure decent housing. No child should have to live with a falling ceiling that impacts their safety and their quality of air. This family has lived in their Englewood apartment for 5 years with little to no repairs by the owner. MTO is supporting the resilient mom who is learning and advocating her rights to safe and decent housing. Your donation to MTO helps keep this family and others from being homeless this holiday season. Stable housing is the gift that keeps giving. Help make a difference by donating HERE today. HELP Educate. HELP Organize. HELP Empower. The mission of the Metropolitan Tenants Organization is to educate, organize and empower tenants to have a voice in the decisions that affect the affordability and availability of safe, decent and accessible housing. Posted in Latest NewsLeave a Comment on Make a Difference this Giving Tuesday! “Like healthcare, housing is a human right”, said John Bartlett, MTO’s Executive Director, Friday night while receiving the 2017 Health and Medicine Policy Research Group Award at the #hmprggala. 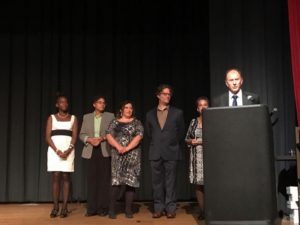 The Health and Medicine Policy Research Group (Health & Medicine) held the Awards Gala to honor the accomplishments of activists and professionals making important strides towards health equity and social justice. 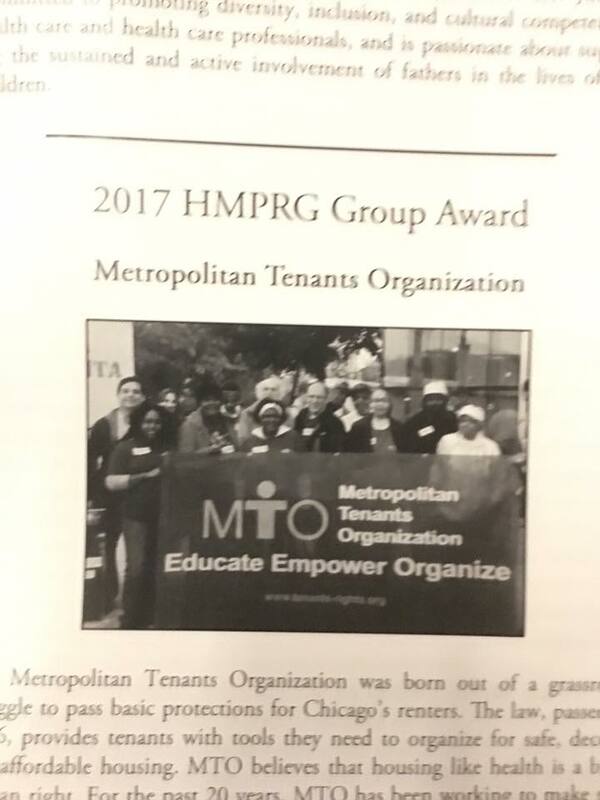 MTO was recognized for its work protecting tenants health and promoting social justice in housing. “Like Health and Medicine Policy Research Group, MTO believes that it is essential to work at the intersection of different social needs”, said John Bartlett, MTO’s Executive Director. It is when we work at these intersections that we begin to understand the barriers to health and well-being. For instance, if a family does not have a decent, stable home, children will not do as well in school. And without a good education, it is harder to get a good job. And without a job it is next to impossible to obtain a stable decent home, and on and on. It is for this reason that we maintain that ike healthcare, housing is a human right”. The Metropolitan Tenants Organization is co-sponsoring “Water at Risk”, a program highlighting the Standing Rock Sioux and Menominee Tribes’ campaigns to protect their tribes’ water resources. Several people have asked why would MTO, a housing organization, sponsor an event like this. There are four basic reasons for our support. First, as a social justice organization, MTO believes that it is essential to stand in solidarity with other groups and peoples demanding their rights. The Standing Rock Sioux and Menominee Tribes are in a major political battle to defend their sovereignty and water rights. Their demands are just. When we stand in support of community struggles, we learn from and create bonds between groups and peoples and build power through unity. Second, the underlying values of our struggles are similar in that each calls into question who gets to determine what gets built on tribal or community land. In one case, we have corporate interests taking the Standing Rock Sioux’s land to build a pipeline. In Chicago and other cities, developers take over land to build apartments, condos, etc. and displace the residents. Whether it is the tribes demanding control over their land or communities demanding a voice in development, we are working for self-determination. Third, both are a struggle for human rights. In the same way that we need water to survive, people need housing to survive. Fighting for human rights has at its core the demand for justice and inclusion. MTO’s mission is one of justice and inclusion. Finally, the struggle at Standing Rock is about people taking action. The encampment at Standing Rock is an inspiration for all and suggests a path forward. 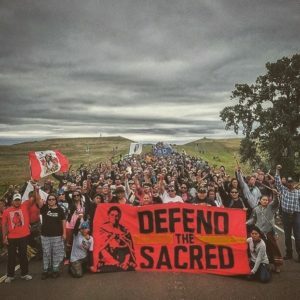 Thousands of people came to support the Standing Rock Sioux and to nonviolently confront through prayer and action the illegitimate construction of an oil pipeline which endangers the major source water for the tribe. MTO hopes to see you at these important events. Two programs are scheduled for August 17. The first at Lincoln Hall at Northwestern University starting at 8 am. The second is at the American Indian Center, 3401 W. Ainsley, starting a 7 pm. Featured Speakers are: Standing Rock Sioux Tribal Chairman David Archambault and Menominee Tribal Chairman Gary Besaw. Just recently, Shondra was walking from work when she passed a rally a couple blocks from her home in Pilsen. She stopped and listened to a neighbor tell how his landlord had just given everyone in the building an eviction notice. Shondra ran home to retrieve a notice she received from her landlord just two days earlier stating that she and her neighbors had 30 days to move out. She returned to the rally with the notice and spoke with MTO Organizer Miguel Jimenez, asking if there was anything she and her neighbors could do. Shondra and other renters in her building quickly worked together to form a tenants association. With the help of MTO and its allies, the tenants association was able to secure time and money to move. Although they had to move out, none of the tenants in Shondra’s building became homeless. Instead, they now have the time and resources to find stable housing in the neighborhood they’ve called home for so long. Please support MTO and help stop Chicago from being reshaped into a city of haves and have nots. We need your financial support to continue our efforts of stabilizing renters access to housing. Too many families are being displaced from their homes and pushed out of the city entirely. Making sure tenants have stable housing and power in the decisions affecting their homes is key to our campaign for Housing Justice. Chicagoans are constantly battling the forces of gentrification and dislocation. Safe, decent, and affordable housing is not a privilege – it is a HUMAN right. Join us and pledge to sustain and expand housing justice in Chicago with a monthly, quarterly, or annual contribution. No investment is too small. 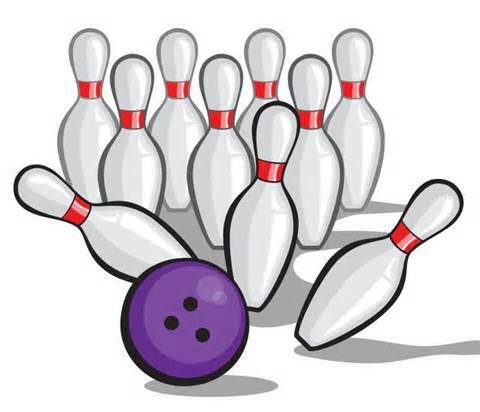 Each year MTO sponsors a bowling tournament to raise funds to support our mission to educate, organize and empower tenants to have a voice in the decisions that affect the affordability and availability of safe, decent and accessible housing. There are 3 ways to get involved! To RSVP or form your own team, call Aisha at 773-292-4980, ext 236. 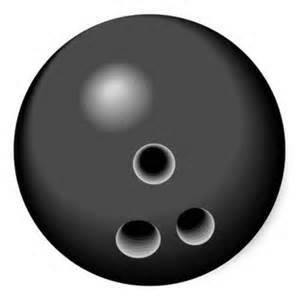 CLICK ON THE BOWLING BALL TO MAKE A DONATION OR PLEDGE. Chicago Wolves; Music Box Theatre, Lou Malnati’s Pizzeria; Zanie’s Comedy Nite Club; White Sox; Glessner House Museum; Jewel-Osco; Brookfield Zoo; and more! Signs outside 1722 W 21st. When the tenants at 1722 W 21st Street got 30-day notices saying they must move out of their apartments, they were outraged. Monroe management had recently evicted their neighbors too. The building next door was gutted and rehabbed, with new rents costing $1,500 a month. 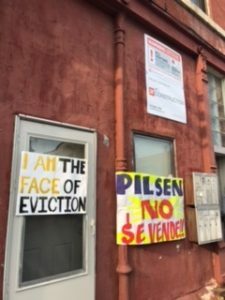 The tenants at 1722 W. 21st were facing an all too common problem – mass eviction and displacement – an epidemic in Pilsen. Eight families were being asked to leave their homes to make way for someone who could pay more. Eight families facing homelessness so that their landlord can make an extra buck. To make matters worse, Monroe Management, the tenants said, was intimidating them by threatening to shut off their water and gas. Feeling ignored, tenants decided they would stick together and seek resources to fight back. 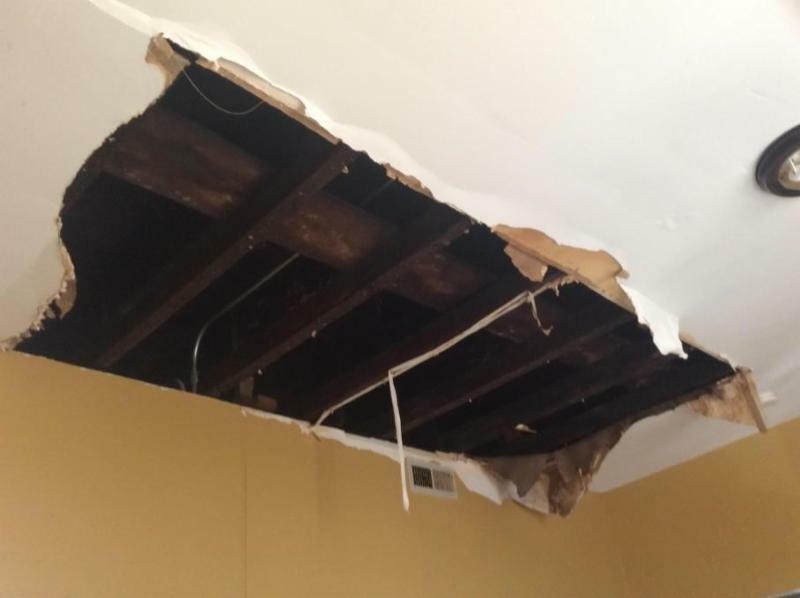 They engaged community organizers, learned their tenant rights, and immediately wrote a 14-day letter asking for much-needed building repairs (the previous owner had neglected the building). They also sought legal assistance from the Lawyer Committee for Better Housing (who has since accepted their case). 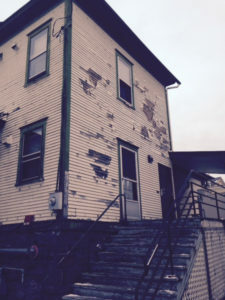 Monroe has responded by making repairs in the building, but they still want the tenants out. 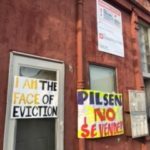 On Wednesday, tenants held a press-conference to decry Monroe’s actions and call for an end to the mass gentrification of Pilsen. Shelonda Montgomery (see video below) spoke about how common it has become for big management companies to “buy up” the community, rehab apartments and price out long-term community residents. Tenants also spoke about the need for rent control and a proactive inspection system in Chicago. One tenant spoke of the need to be engaged in the struggle – together – to fight against housing discrimination. The tenants at 1722 W 21st Street will soon have their day in court, together, thanks to the community members and allies that continue to support our work. Check out the Twitter story below!